Tango update to enable cheap Windows Phone 7 handsets from Nokia? What comes after Mango? Tango. At least that’s the latest rumor regarding Windows Phone 7, which saw its first major update released to manufacturers just a couple of weeks ago. Tango is reportedly a minor update (like NoDo), which will focus on bringing WP7 to lower-end phones (current minimum requirements for a WP7 handset are rather high). The update may even be all about Nokia, who plan to push Windows Phone prices down. 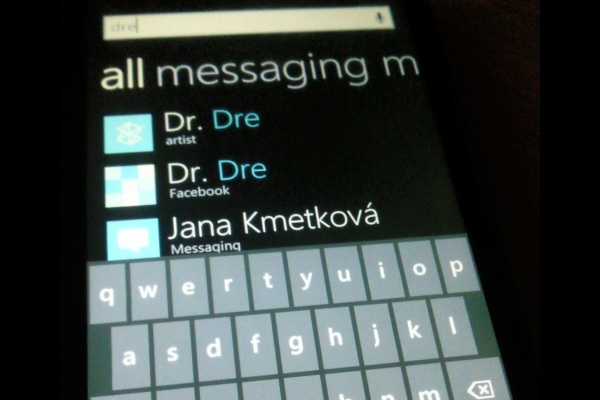 The image above is allegedly a leaked screenshot of Windows Phone 7 Tango, showing off Content Search (a feature that does local and online searches simultaneously, including Facebook pages). Microsoft is mum on the subject but the rumor mill suggests that Tango will be focused on Nokia’s WP7 efforts and may be aimed primarily (or even exclusively) at the Asian market. Tango devices will reportedly be cheaper but there’s no info on how that will be achieved. Also, Windows Phone 7 Tango and Nokia Sea Ray were mentioned together, even though the device should launch with Mango. WP7 minimum requirements are pretty strict but they do allow some leeway, which could be how Nokia plans to create low-priced handsets. Current Windows Phone 7 handsets have WVGA resolution, but WP7 was supposed to support HVGA too. RAM minimum is set at 256MB and the CPU should have a Scorpion core, like Snapdragon chipsets do. There are 800MHz versions of that, not just 1GHz (which is what current WP7 phones are using).